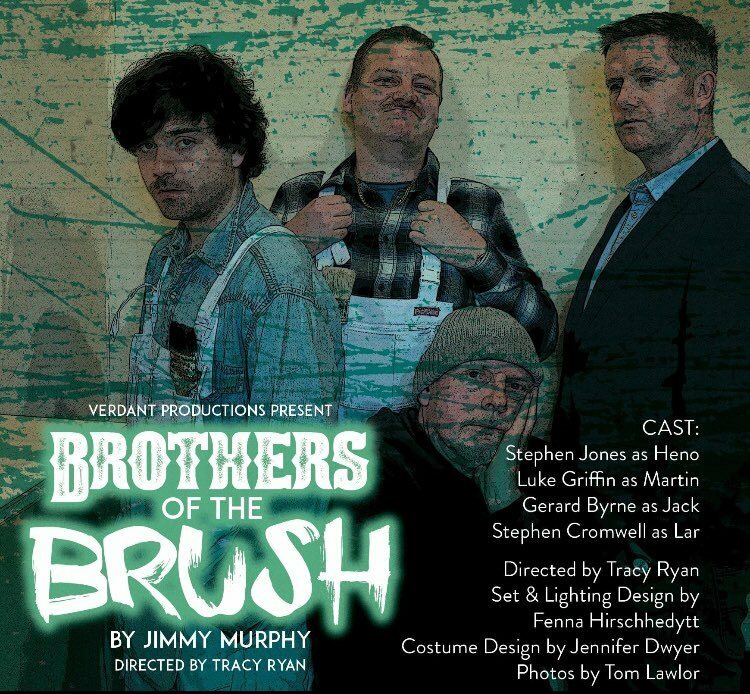 Brothers of the Brush – Viking Theatre – Review by Frank L.
Brothers of the Brush was first performed in the 1993 Dublin Theatre Festival. 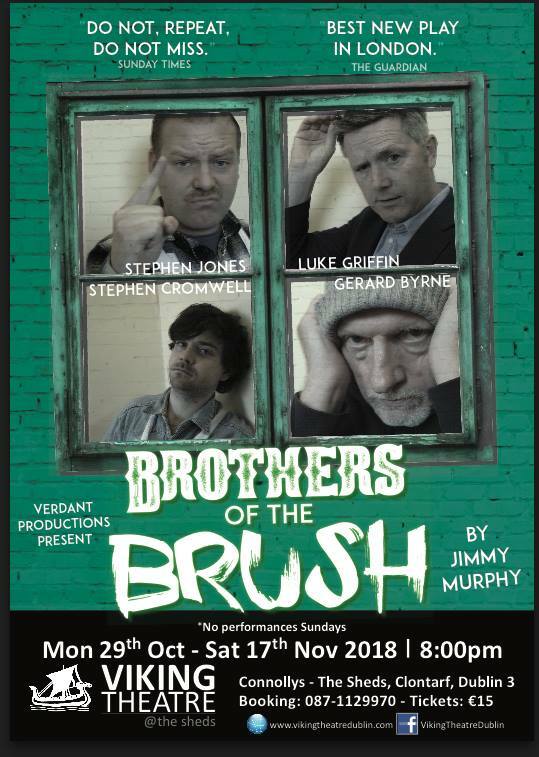 It is a comic look at three Dublin painters involved in the dodgy renovation of a house. Henno (Stephen Jones) is a painter who believes in the demarcation between the various trades, so he will not do a job of a carpenter. Lar (Stephen Cromwell) is more flexible about what he will and will not do, influenced by the fact that he has moved out of “the flats” with his young family and is the proud possessor of a mortgage. At times he has been perilously close of having his home repossessed. Jack (Gerard Byrne) is considerably older than the other two. He believes in promotion through seniority; therefore when the prospect of a foremanship on a new factory job came into view, he considered that it was his by right. Their boss is Martin (Luke Griffin), whose father started off with Jack as a partner but has, by whatever nefarious means, managed to become the boss of this small painting and decorating outfit. His particular managerial skill is cutting corners. He thinks that Lar would be the best man for the foreman’s job. An anonymous Trade Union’s presence is felt throughout by many references to its rules and practices which are enforced or discarded as it suits the characters. The set is a room in the house being renovated and the usual paraphernalia associated with painters is on display including a wall half painted. However, there are some floorboards which Lar saws in breach, as Henno points out, of the demarcation rules between trades. The script has many comic lines which delighted the audience. The script has not, however, been updated to take account of the twenty-five years since it was first produced, so the monetary amounts seem small nowadays. Needless to say there is a lot of talk about money. However, the sharp practices revealed are still alive and well so the main thrust of the action is very familiar to an audience today. It is a comedy in two acts which lasts just under two hours with a fifteen-minute interval. The first act might benefit from a little pruning while the crispness of the second act brings an urgent sense of purpose to the twists and turns of the comic plot. The overall result is one of contented laughter from an appreciative audience.